The tallest living sand dune on the Atlantic coast is a premier location for kites, sightseeing and sunsets, with a view arcing from the ocean to Roanoke Sound. A visitor center with museum and 360-foot boardwalk with exhibits explain the dune’s ecology and are a gradual entry to the massive dune field. 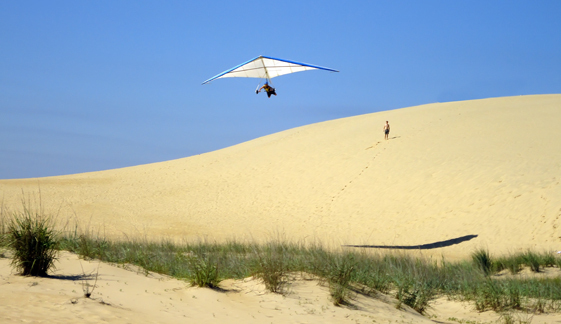 Sandboarding is welcome with permit and hang-gliding is available through a vendor. Shoes and sun protection are recommended. By calling ahead 24-hours in advance, it’s possible for mobility-impaired visitors to schedule a ride in our all-terrain-vehicle to the top of the dunes. The soundside access of the park is a different experience offering sunbathing, wading, paddling and a one-mile nature trail that opens onto wetlands, grassy dunes and maritime thickets. Approximately 56 miles from Elizabeth City.